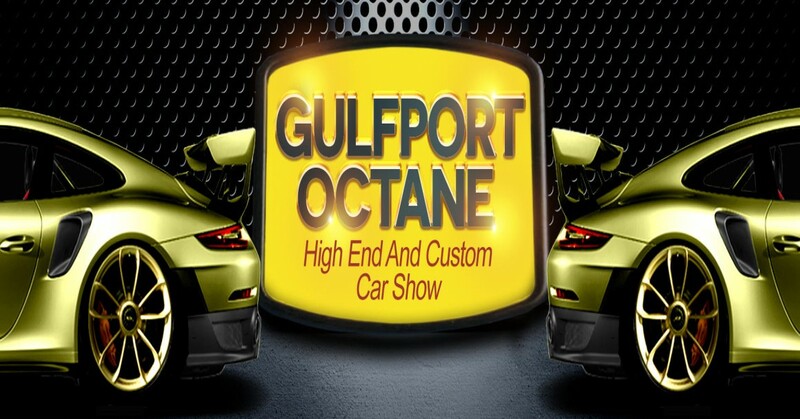 Gulfport Octane Car Show - ROUND 2! Gulfport Police Department, Gulfport Main Street Association, and The4Media.com are bringing back the high end and fine exotic vehicles to gather once again on the Gulf Coast. Our goal is to spend an enjoyable day relaxing on the coast with fellow automotive enthusiasts and owners. Registration will insure vehicle access to your restricted main stage parking spot in the event area. We will have security at the event to monitor the registered parking area. Reserved event show parking for the will be $50 with late registration (the week of the event) being $80. If you register late, we cannot ensure that your vehicle will be with similar styled vehicles in the main parking area . If you choose to register late, you may be in an overflow section if there is space available. All Pre-registered entrants are asked to arrive between 7:30am and 9:00 am to allow for the staging of vehicles. You will be updated on your Main Stage Parking Pass location retrieval prior to the event and info will also be available the morning of by our staff. Please allow time to detail your vehicles prior to arrival if necessary. We will close ALL registration and will not allow vehicles to enter by 10 PM sharp on November 9th. We are asking that all entrants please stay until at least 2 pm to allow spectators to have a chance to view and enjoy the cars. SPIRIT AND INTENT: This events main goal is the same this year as it was previously, to allow automotive enthusiasts, owners and families to enjoy vehicles that are normally not seen commonly on public roads or are shown at venues far away. With that being said, we know that some may consider the list of cars being accepted to, "not" be exotic or a vehicle denied entry to be considered more exotic or rare than one accepted. We will as promised be opening the event to allow more makes and models in that are show worthy. Although we would love to invite all makes, models and years...Given the limited space we are looking to showcase the premiere cars in the genre that this show is promoted as. Below is a list of vehicles we are allowing to register for the event. As mentioned above, this year we ARE opening the event to show worthy custom cars, trucks, and bikes! If your vehicle is not on this list and you have a unique custom vehicle, please email jude@the4media.com with pictures and your mod list for acceptance. We are opening up the event to include a few more eye catching vehicles, if you feel that your vehicle is unique and show worthy, send us an email to jude@the4media.com with Gulfport Octane as the subject. Please include pictures and a mod list.